Globally, the percentage of married fecund women with unmet need—who use no contraceptive method despite wishing to avoid childbearing for two years or more—fell from 22% in 1970 to 12% in 2010. Substantial health, economic and environmental, and demographic benefits have resulted from this change. Promotion of contraception is one of the great success stories of the past 50 years. 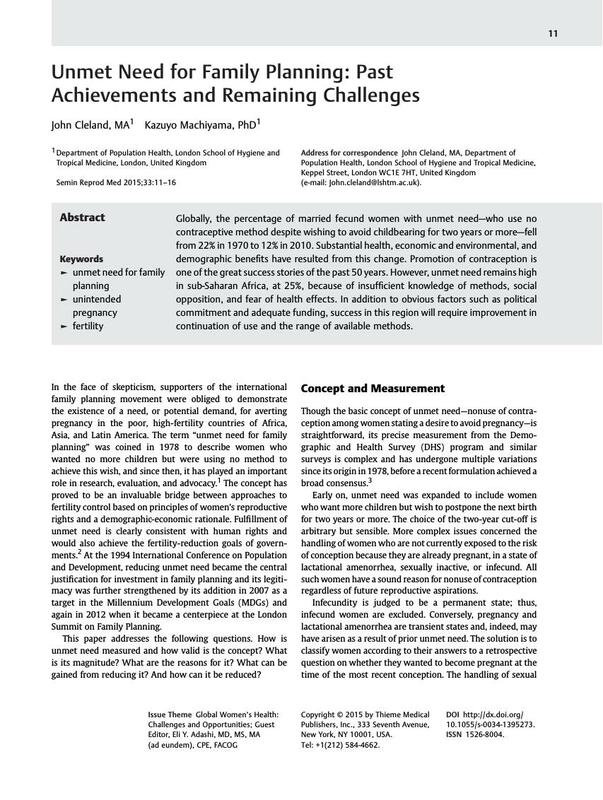 However, unmet need remains high in sub-Saharan Africa, at 25%, because of insufficient knowledge of methods, social opposition, and fear of health effects. In addition to obvious factors such as political commitment and adequate funding, success in this region will require improvement in continuation of use and the range of available methods.